Experience the vibrant Mayan culture first hand combined with the peace and beauty of Tibetan spiritual practices in a one-of-a-kind event held in Mexico’s stunning Riviera Maya. Hacienda Tres Rios resort is hosting its Mayan Tibetan Bicultural Encounter for the second year in a row. This memorable week is filled with spiritual ceremonies, entrancing traditional dances and eye-catching artwork from two fascinating cultures from opposite sides of the globe. From September 11 – 16, 2012, guests staying at the Hacienda Tres Rios resort will have the chance to participate in an extensive list of activities highlighting Mayan and Tibetan cultures in the paradise-like setting of Mexico’s Caribbean coast. Event attractions include conferences by archaeology and astronomy experts, beautiful dances combining Mexican and Tibetan traditions, a cleansing ceremony at a cenote set in the resort’s lush jungles, a fire ceremony, ancient Mayan Temazcal rituals, Tibetan blessings known as “pujas” and breathtaking sand mandalas created by skilled Tibetan monks. In addition, Cancun Theater in the exciting Cancun Hotel Zone will be hosting a special presentation featuring Mayan and Tibetan dance rituals on the evening of September 13, 2012, a show you won’t want to miss! Monks from Drepung Loseling Monastery will fuse their traditions with the local Mayan population for an absolutely unforgettable event at the Second Mayan-Tibetan Bicultural Encounter 2012. Mexico Today recently had the opportunity to interview Bruny Schoener, one of the creators of this vivid cultural event, to get her view on how the encounter began and its positive effects on both the Tibetan and Mayan cultures. What is the name of the monastery of the monks that will attend the encounter? 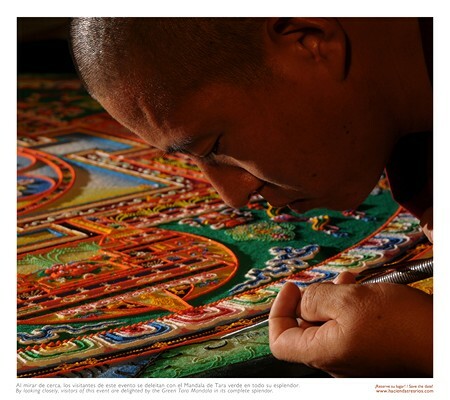 What do Mayan and Tibetan cultures teach? How are the Mayan and Tibetan cultures similar? Combining two cultural experiences is such an enriching way to explore our world. I’m so excited to learn more about this event. HTR – your commitment to the environment around you as well as the world at large, is truly inspiring. One example of how the Mayan and Tibetan cultures are similar is both cultures have ceremonies where they chant or sing to the four cardinal points, tying the four corners together. Both Mayan and Tibetan cultures are interested in the common good and obtaining inner peace. Drepung Loseling Monastery is where the monks are from. Tibetan & Mayan cultures are similar in where peace, & harmony start from your inner being, spirit. They both pray & chant to create connection, of earth, body, & spirit. I love seeing how Gods children find connection with each other, instead of seperation. For certain, we are the human race, a whole rainbow of people, animals, & earth, connected. To the universe, our planet & it’s inhabitants. Drepung Loseling Monastery is the name of the monastery where the munks are from. What is the name of the monastery of the monks that will attend the encounter? The answer is Drepung Loseling Monastery. Q: What is the name of the monastery of the monks that will attend the encounter? The monastery is Drepung Loseling Monastery. The monastery name is Drejung Loseling Monastery. THE NAME OF THE MONASTERY IS…DREJUNG LOSELING MONASSTERY. Tibetans learn their history from past generations through their tablets, while Mayans pass down their history through legends, word and dance. As a result, ceremonies performed by Tibetan monks all have a similar feel no matter which monastery they belong to, while Mayan shamans each add their own personal style to their ceremonies. That being said, there are also several surprising similarities. For instance, both the Tibetan and Mayan cultures have ceremonies where they chant or sing to the four cardinal points, tying the four corners together. What Do Mayan and Tibetan culture’s teach? The Maya taught that the Milky Way Galaxy is the generator of life. In the Yucatec language, the architect of the universe is called “Hunab K’u,” meaning the One Giver of Movement and Measure; the Absolute Being; The Center of the Galaxy; The Universal Dynamism which stimulates and motivates life in its total manifestation of spirit and matter; the principle of intelligent energy that pervades the entire universe, animate or inanimate. They were also fine artists, goldsmiths, and coppersmiths. They are believed to be some of the earliest astronomers. They understood mathematics and were the first to recognize the need for “zero” in figuring large numbers. The Mayans also had a complex calendar and a well developed hieroglyphic system of writing. One question that puzzles many is the fact that the descendants of the Mayan represent a seven million plus population in the Yucatan of Mexico — how can the Mayan civilization be dead? The culture of these ancient peoples has vanished, leaving us with yet another mystery. Tibetan Buddhism teaches that we are all potential Buddhas, because we are essentially pure and luminous at the most basic level of existence. That purity, called Buddha-nature, is typically clouded over by a dense layer of ignorance and negativity, which dominates us and leads to suffering. The Tibetan Buddhist path encourages its practitioners to adopt the traits and characteristics of enlightened beings through the use of special meditation techniques, thereby realizing their innate Buddha-nature. The Tibetan and Mayan cultures are simular as both have ceremonies where they chant or sing to the four cardinal points. the purpose of the Buddha’s teaching, as practiced in Tibet, is to develop loving-kindness and compassion. Traditional Tibetan culture has been evolving for over 2000 years, and is still actively practiced throughout much of the Himalayan region, including Bhutan, Mustang (Nepal), Sherpa regions (Nepal), Dolpo (Nepal), Sikkim (India), Assam (India), and Ladakh (India). Traditional Tibetan culture has been greatly influenced by the unique Himalayan and Central Asian geography and the religion of Buddhism. The Dalai Lama is a high lama in the Gelug or “Yellow Hat” branch of Tibetan Buddhism. The name is a combination of the Sino-Mongolian word далай (dalai) meaning “Ocean” and the Tibetan word བླ་མ་ bla-ma (with a silent “b”) meaning “chief, high priest”. 2.- las 2 culturas nos enseñan el amor a la madre tierra y deben asentuarse en el amor a la vida, los animales y el reprto a la madre tierra.. al planeta. 3.- tenemos cantos y bailes con los 4 puntos cardinales, danzas ansetrales, ceremonias espirituales. .What is the name of the monastery of the monks that will attend the encounter? The Mayan and Tibetan cultures are similar in that both the Tibetan and Mayan cultures have ceremonies where they chant or sing to the four cardinal points, tying the four corners together. Tibetan and Mayan cultures have ceremonies where they chant or sing to the four cardinal points, tying the four corners together. 2.- los myas transmiten sus conocimientos atraves de leyendas y danzas y los tibetanos transmiten sus conociminetos de generacion en generacion atraves de tablillas, y amabas nos eseñan el repseto que debemos tener por la madre tierra y a nuestros hermanos del planeta. Q. What is the name of the monastery of the monks that will attend the encounter? The idea to create an event combining spiritual practices and cultures came from Daniel Arroyo, joint Vice President of sales and marketing at Hacienda Tres Rios. Seeing the beautiful Hacienda grow from its roots was inspiration enough for the Arroyo family to create such a marvelous encounter, where nature merges with the culture of native Mayans and the great spiritual strength of the Tibetans.When living in the Yucatan Peninsula, you get to experience the magnificent and peaceful energy of the area, so the thought of bringing together the traditions, spiritual practices and beliefs of these two great cultures came naturally. Combining the heights of Tibet with the turquoise ocean of Quintana Roo, and the cold snows of the Himalayas with the warmth of the tropics allowed us to create a unique event that highlights the best of both. B las dos culturas enseñan el ampr y el respeto a la naturaleza, considerando l atierra como una madre y el sol como un padre.